» How to Study for the Enrolled Agent Exam: 7 Steps to EA Exam Success No ratings yet. 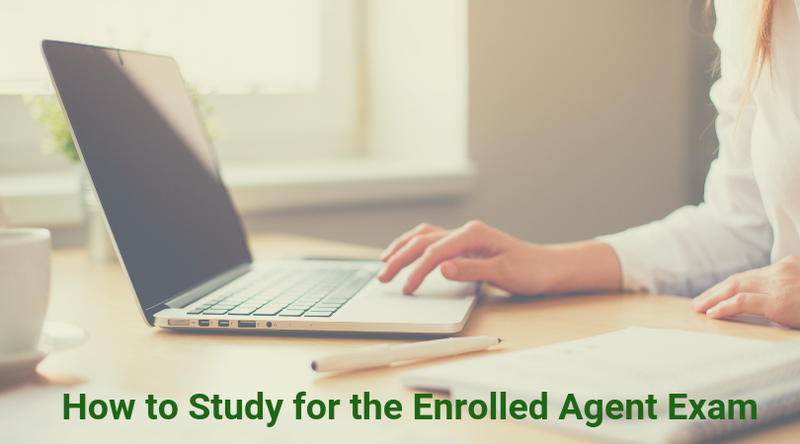 Are you ready to study for the Enrolled Agent (EA) exam? If so, I’ve got 7 study steps that will help you prepare to pass the EA exam (officially called the Special Enrollment Exam (SEE)). All of these steps require an enrolled agent review course, as that’s the best way to get ready for the exam. But, these tips will work with almost all EA review courses. So, now that you’ve got your study materials, let’s discuss how to study for the Enrolled Agent exam! Here’s a quick summary of my 7 steps to studying for the EA exam. Take a short quiz to assess your understanding. Read the relevant sections of the book. Watch video lectures or listen to audio lectures. Take another quiz to test your comprehension. Take a cumulative quiz to increase retention. Complete a final review before your exam date. Now, I’ll go into more detail about each step so you can easily follow this approach. At the start of your studies, you should take a short quiz. I know starting with a quiz may sound counterproductive and discouraging, but it’s actually the opposite. When you take a quick quiz every time you begin a new study unit or module, you can evaluate your understanding of the topics you are about to study. Then, using that information, you can determine just how much and how long you need to study these topics. And the quiz really can be very short: the ideal length is approximately 15-20 questions. Furthermore, when you’re answering these questions, you shouldn’t feel frustrated if you don’t know the answers. Instead, you should feel relieved that you can see your strengths and weaknesses, as these provide study direction and clarity. The point of this study step is to gauge your comfort level with old and new material. So, when you get your results, you’ll have an understanding of how long you need to master the topics presented. If your score was on the lower end, you may need to spend some extra time studying this study unit or module. Once you finish the quiz, it’s time to carefully review the explanations for both the correct and incorrect answers. This way, you’ll know exactly why the right answer was right and the wrong answers were wrong. At this point, in order to progress your learning, you must take the time to really understand why the reasoning behind each answer option. Focus on the information you’re receiving and commit it to memory. Additionally, you should make a note of any specific idea or principle that tripped you up during the quiz. With these notes, you can improve in the appropriate areas and avoid similar mistakes in the future. Now that you’ve seen some practice questions, you should have a greater appreciation for the content in the book. And, the quiz you took has given you a game plan for getting through the next study unit or module. So, keeping your current understanding of the topics in mind, you should read the relevant sections in your book. To truly study effectively, you should read the parts of the book addressing your weak areas more slowly. Moreover, taking notes or highlighting makes you a more active reader. Therefore, you can use these activities to maximize your study time. So, you’ve read the appropriate sections of the book and dedicated additional time to the parts covering your weak areas. But what if an important concept is still unclear? What if your confidence in your own comprehension is still shaky? What can you do? When you need to dive deeper into particularly troublesome topics, you should turn on a video or audio lecture. Usually, video and audio lectures provide a fresh perspective on certain concepts. Additionally, the professors leading these lectures often walk through applicable examples of key topics. Consequently, you can use these materials to strengthen your understanding and ensure that everything clicks in your mind. Watching video lectures or audiovisuals is most helpful for visual learners. In the same way, listening to audio lectures can be crucial for auditory learners. However, if you already understand the material really well after reading the book, you may want to skip this step, especially when you’re short on time. If you do watch the lectures, watch actively by taking notes and/or highlighting in your notes or in your book. After you’ve finished your initial review, you won’t be able to see how much headway you’ve made unless you take another quiz. When creating your follow-up quiz, you should instruct your test bank to pull a larger quantity of questions (if possible). That’s because answering just 15-20 questions again won’t sufficiently test your understanding at this point. Depending on how many questions in the bank address the desired topics, you may want this quiz to include all of them. However, try not to answer more than 100 questions in one sitting, as that can be overwhelming. Once you’ve moved past the second study unit or module, you can start tracking your overall study success with cumulative quizzes. These quizzes should contain 5-15 questions from previous study units. Not only will these cumulative quizzes boost your retention, but they should also help you reduce the duration of your final review. Retaining what you’ve already learned equips you to study more efficiently and avoid restudying large amounts of material. Once you’ve completed every study unit or module in your course, you can commence your final review. What is a final review? Usually, this conclusion to your studies involves taking a practice exam that emulates the real EA exam. Since a practice exam recreates the testing environment you’ll experience at Prometric, you won’t be able to see any real-time feedback on the questions you’re answering. But, once you’ve completed a practice exam, you’ll know exactly where your remaining weak areas are. Then, after you’ve identified these weak areas, you can use your test bank to build more quizzes covering these areas. Take 3-5 quizzes of 50-75 questions each day until you reach a proficiency score of 80% or higher on all topics and subtopics. You’ll want to complete this final review approximately 3-5 days before your scheduled exam. Although, if you anticipate needing more time to fine-tune your weak areas, start your final review 6-10 days in advance. Since you’ll be aware of your weak areas throughout your studies, you may be able to estimate how long you’ll need for a final review. Additionally, most EA review courses include comprehensive analytics, so you can rely on the latest data to inform your final review schedule. Now that you have an effective study process for the EA exam, you can further optimize your studies by applying these tips. In order to successfully review all of the exam content before your testing appointment, you must study regularly. Consequently, setting up a study schedule is essential for achieving this goal. Thankfully, most enrolled agent review courses provide you with a study planner, the perfect tool for developing your review routine. Find the best study spot. To make the most of your study sessions, you need to hold them in the most conducive location. So, avoid studying in particularly loud or busy places, as these will surely be distracting. Instead, seek out a spot with noise and activity levels that will really help you concentrate. When you take practice quizzes, be sure to read all of the questions as thoroughly as possible. By doing so, you can identify the actual requirements of the question. Reading the question too quickly or haphazardly can lead you to misunderstand it. Then, you’ll choose the incorrect answer choice and fail the question. Consequently, you must take the time to truly comprehend the question. Study with an exam-emulating course. A course that reproduces the Prometric testing environment enables you to get comfortable with the exam before you take it. That’s because such a course shows you how the exam looks and operates and, as a result, lets you learn about the exam functionality as you learn the exam content. If you ever feel disheartened by the exam, don’t forget about all the resources available to you. From your friends and family to your review course, you are not alone in studying for the EA Exam. Even all your friends and family can do is offer a listening ear, that may be enough to help you stay positive as you study. Additionally, most review courses supply candidate support as well. For instance, EA review courses may give you access to professors, exam mentors, or forums in which you can talk about your experience with other candidates. You know the steps to study properly for the EA exam, but do you have everything else you need? For instance, do you have the right EA review course for you? If not, I can help you find it. I can also help you save on your EA exam prep with my EA discounts. If you’d like even more guidance for your EA journey, sign up for my free enrolled agent e-course. It’s packed with even more valuable information about preparing for and passing the EA exam.